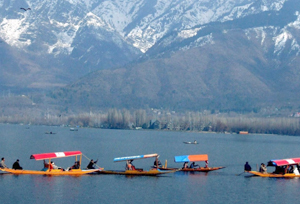 Jammu and Kashmir, the land of enchanting beauty is heaven on the earth. This is the most sought after place that is frequently visited by the tourists throughout the year. The snow-clad mountains, quaint surroundings, serene environment, deep valleys and pristine lakes give tourists an exquisite experience that is hard to find anywhere else. There are tourist attractions in Kashmir such as the Srinagar, Pahalgam, Gulmarg, Aharbal, Yusmarg, Kokenag, Verinag, Sonamarg and many more. A trip to this awe-inspiring region cannot be termed as complete without staying in good hotels and resorts. When it comes to accommodation, there are lots of magnificent hotels in Jammu and Kashmir that offer a comfortable stay along with the quality facilities and services. The hotels in Jammu & Kashmir are available ranging from the luxury hotels to budget friendly resorts providing first-class amenities to the myriad of guests visiting the region. Just imagine sipping a hot cup of tea standing in the private balcony and witnessing the beautiful vistas. This a kind of unforgettable moments that can be only experienced by staying in the best Jammu and Kashmir hotels. The hotels in Kashmir make every effort to provide a homely experience to its guests. For this very purpose, it is made sure that the rooms are decorated with wonderful decor and loaded with great facilities like 24-hour room service, air-conditioner, television, gym, spa, bed, attached bathroom, internet access, doctor on call, tea/coffee makers and so on. The food offered by the resorts here are very scrumptious and the guests can delight their taste buds with various kinds of cuisines such as the Indian, Continental, Chinese and local Kashmiri dishes. The food prepared by the expert chefs enhances the taste of cuisines by adding best flavors. Moreover, the best thing here is that the staff of the hotels is very friendly and ensures that the visitors return with the incredible memories. At Tour my India, we offer the excellent hotel deals to the tourists searching for the utmost comfort and relaxation in Jammu and Kashmir. Make your bookings at the best hotels to prevent yourself from any inconvenience.